Democracy in Motion? Operationalizing Our Values Through the Co-op Index Report - CooperationWorks! Who doesn’t love talking about the co-op advantage? Co-ops, because of their member-based, problem-solving focus, enjoy a marketplace advantage based on trust and a core set of values and principles. This advantage, however, only works if the co-op engages those values and principles. How can members, directors, and managers assure that their co-op embraces the co-op identity and the advantage that comes with it? The CIT reveals what co-op workers think about the ability of the co-op to engage the co-op identity. The Co-op Index Tool offers a mechanism to measure a co-op’s ability to manage within the co-op identity. Created by researchers, developers, and practitioners, the CIT provides several levels of analysis, from a broad overview with four key indices to specific statements on the ability of the co-op to engage values and principles. The CIT reveals what co-op workers think about the ability of the co-op to engage the co-op identity. The Indices include Organizational Trust, Co-op Values, Co-op Principles, and Organizational Maturity. Values include the co-op values and ethics of the Statement on the Co-operative Identity. Principles include the principles listed in the identity statement as well as four principles specific to worker co-ops enshrined by Mondragon (pay solidarity, participatory management, subordination of capital, supremacy of labor). The Organizational Maturity Index comprise four areas and 32 dimensions (see table). The convictions and attitudes of workers reflect the condition of the organization. People want to understand and feel secure in their environment. People are free regardless of what they are told to do or what they seem to do. Everyone has the capacity to become a better person and create an effective values-driven cooperative. The third point can be a bit confusing, but essentially people have agency in their lives regardless of the level of command and control in an organization. People also have an amazing ability to develop “work-arounds” when a system doesn’t meet their needs. The CIT helps uncover areas where the workers in a co-op may fundamentally disagree with the views of leadership even if it appears to leadership that little or no conflict exists. 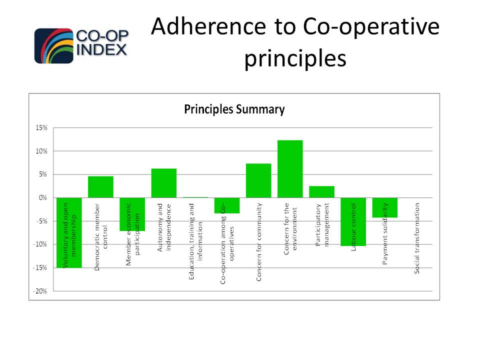 The Co-op Index Tool provides a means for co-ops to engage in an analysis of their ability to put their values and principles into action. The CIT uses a process of triangulation to engage the varied viewpoints. A co-op developer trained in using the CIT provides third-party facilitation and review while participants complete a lengthy survey asking their level of agreement with statements about the co-op. The results may be separated out between management and workers (or other demographic groups) and then compared to each other and to the approved policies and procedures of the co-op. The developer may also interview workers of the co-op to gain greater insight into the responses and areas of disagreement between policy and actual experience. The developer works with a committee to prepare a report and recommendations and presents these to the co-op membership. 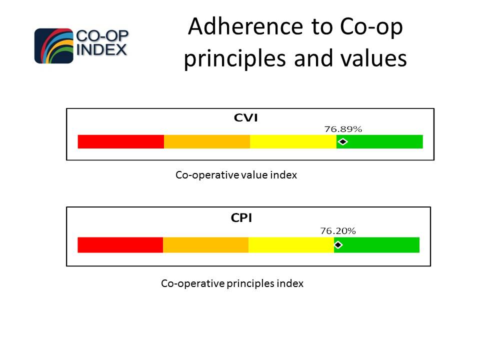 The Co-op Index Tool provides a means for co-ops to engage in an analysis of their ability to put their values and principles into action. While many members may simply assume that the co-op succeeds, the documentation helps co-ops reaffirm their principles and value-driven policies much like a financial audit reaffirms that the co-op has managed its money in a principled manner. The CIT can be part of a larger social audit or provide an internal stakeholder analysis for strategic planning. The CIT offers an internal stakeholder analysis even in a consumer or producer co-op. It has been translated into several languages and has a “flattened hierarchy” version, along with versions that have been used in consumer co-ops managing through a staff collective. The CIT uses MS Excel for most of its calculations and through some hard work by CW! Member Jim Johnson, an NWCDC volunteer, Luke Pendergrass, and myself, John McNamara, planning has begun to elevate the CIT to a cloud-based app to allow greater usage. For more information on the co-op index, visit coopindex.coop. Co-ops do enjoy a “cooperative advantage” based on the values and principles of the co-op identity; however, hanging values and principles on the wall of the co-op isn’t enough. For the advantage to really translate into a sustainable and resilient economic model, the values and principles need to be active throughout the organization’s operations. The CIT assists co-op in strengthening their co-op identity creating a values-based choice for those with whom the co-op does business.